﻿Fishing holiday accommodation for anglers in UK. Do some of your group want to get their rods out and fish on holiday? Locations with self-catering cottages and houses convenient for fishing throughout UK. Are you organising a holiday for keen anglers or people who want to learn to fish? Hands apart! We have all seen people who have done it! Anglers, that is, their hands apart, palms facing inwards, describing the BIG one – that is, the very BIG fish that got away. There are so many locations in the UK where anglers can go fishing. And whether the preference is for salt water fishing by the sea or off the coast, or for freshwater fishing in lakes, lochs, rivers or other freshwaters, the UK is renowned some of the finest fishing available anywhere. For those not so keen to fish there is always amazing walks along the river banks or beaches if it's sea fishing that your friends are after. 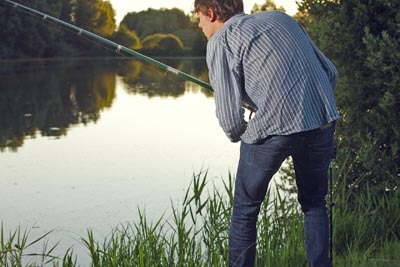 And while some people, particularly the men but also women, sometimes like to head off for a day’s secluded fishing on their own, it is otherwise a very sociable and relaxing sport, especially afterwards when each regales the other about the 'one that got away'. Better still to eat the catch of the day - holiday houses are well equipped for self-catering and often have a barbecue for alfresco dining outside. Most are pet-friendly, which means that a family holiday can be complete with the inclusion of the four-legged friend who would normally have to be placed in kennels! And not only that, but many of the pubs and restaurants in the area are pet-friendly too. However, it’s not especially enjoyable to go too fishing alone too far from home, especially for an overnight stay. largeholidayhouse.com offer solutions for groups who wish to head off on an angling break to compete against friends and then in the evening be able to regale one another about the BIG ones that got away! You will see self-catering accommodation in big cottages and houses for groups of people who want to head off together to one of the many wonderful fishing locations throughout the UK. So whether it’s carp fishing in Essex, coarse and trout fishing in Devon, salmon, trout and sea-trout fishing in the Teifi Valley in Wales or even fly-fishing for Atlantic salmon and trout in Scotland, you will find a wonderful rental home for the entire group to stay in, even at the last minute, all under one roof. 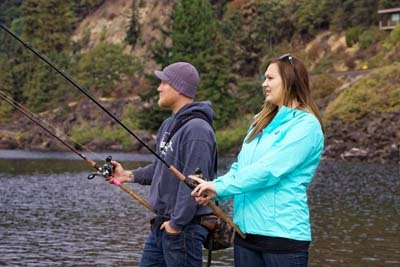 Everyone will have a favourite fishing location - take friends and they may become hooked! If you’re a keen angler, then there is no doubt that Cumbria and the Lake District is the right place for you. The lakes, rivers, streams, and other bodies of water provide a fantastic choice of freshwater fishing for both coarse and game fish. Add in the incredible scenery, and you’ll come home having had a fishing experience second to none in the UK. Fishing clubs and fisheries throughout the Lake District and Cumbria as a whole are very professionally run. Many of the bodies of water in the Lake District are lightly fished. There is plenty of free fishing, and where there is a charge, widely available daily and weekly permits tend to be readably available and sensibly priced. Don’t forget that the Cumbrian coast proximal to the Lake District offers great opportunities for sea fishing, especially flatfish and bass. Even the occasional angler who decides to go fishing on the spur of the moment having brought no fishing gear will have no trouble in finding a well-stocked angling shop where equipment can be bought or hired. And the completely inexperienced novice will receive expert advice and guidance, and even be able to learn to fish if they’ve never been fishing previously. And the great thing about the Lake District is that there are so many attractions to see and things to be done in the region that any non-fishing members of the group or family will find plenty to keep them busy before the angler returns to regale them with hands held traditionally wide apart accompanied by the usual story of the one that got away! And it must be said that the range of fishing is matched only by the range of other activities available to the Lake District visitor. Of course, with so many visitors there are plenty of places to stay and eat in the Lake District. For convenience of timetable, self-catering is possibly the most suitable form of accommodation, because the angler can come and go as they please, without worrying about missing dinner or disturbing other guests. There is an unbeatable range of cottages, chalets, lodges, apartments and houses available to suit all budgets. And perhaps the single most important reason for the angler to choose self-catering accommodation is that they can always cook the catch that didn’t get away! While there are more bodies of water to fish on than could be mentioned in tens of pages, Lake Windermere deserves an individual special mention as having always played a very prominent part in Cumbrian fishing. So much so that Windermere 'perchines' (canned perch) were produced as a substitute for sardines during the Second World War. The Arctic charr is a popular local delicacy that is still fished from traditional boats on the lake. However, it is a fairly rare species, so do check when you visit whether it can be fished or not. Pike, perch, brown trout, eels and roach can also be caught, while sea trout and salmon pass through the lake to spawn. Young trout and salmon migrate downstream through the lake on their way to the sea in spring. There are a few rules and regulations anglers must adhere to if wishing to fish on Lake Windemere. They must have a current Environment Agency rod, adhere at all times to Environmental Agency Byelaws, good angling practice and any local and/or seasonal restrictions in place that protects fish, vegetation, birds and other wildlife. And they must not, under any circumstances, use live bait, as this increases the risk of the introduction of disease and pest species. In fact this practice is totally banned by the Environment Agency. Each body of water will have its own rules and regulations, so it is vitally important to check in advance, not only from a legalistic point of view, but also out of simple courtesy to the owners. Accommodation for a large group in Powys near Brecon with 6 bedroom, sleeps 12, Pets friendly, Barbecue, Pub within 1 mile, Wifi, Cot Available. Outstanding large holiday house in Glamorgan near Swansea with 6 bedroom, sleeps 14, Pets friendly, Wifi, Cot Available. Large holiday house to rent in Gwynedd near Caernarfon with 6 bedroom, sleeps 12, No pets, Barbecue, Ground Floor Facilities, Wifi, Cot Available, Coastal Property. A unique large holiday home in Shropshire near Bridgnorth and Ironbridge with 9 bedroom, sleeps 20, Pets friendly, Barbecue, Ground Floor Facilities, Golf nearby, Pub within 1 mile, Wifi, Cot Available, Fishing Nearby, All En-suite.